TLC House & Pet Sitting Service, LLC is a growing business which focuses on providing high quality pet sitting services to our valued clientele. We are looking for responsible, detail-oriented and professional individuals who are compassionate toward animals qualified. All of our Pet Sitters are professional independent contractors who work with our company. 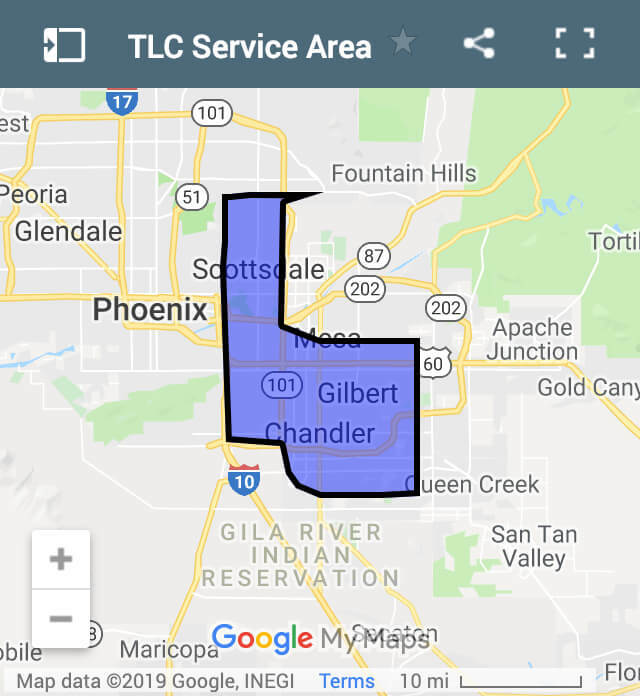 Please review our service area as we only work with sitters that live in our service area. This is to minimize the drive time between pet sitting visits all sitters must live in Temp, Chandler, Gilbert, Mesa and Scottsdale. Please NO calls about being a pet sitter. YOU MUST LIVE WITHIN AREAS OUTLINED ON THE MAP. TLC sitters provide trusted, personalized care for clients’ homes and display a loving, caring disposition with their pets while they are away. Personalized care includes: providing fresh food, water, TLC / attention, play time, as well as yard / litter box clean-up. Other responsibilities may include: behavior modification, medication administration, and / or additional duties as assigned by the client. Please see our service page for types of visits. Available between 6-9 am, 10-2 pm, 4-8 pm. This does not mean you can work weekends only. Have a flexible schedule 7 days a week. Typical duties include, lots of TLC, walking, feeding, administering pills, taking in mail, newspaper, plant watering, cleaning pet bowls and picking up after pets. Provide service at the pet owner’s home for a duration of 30-60 minutes for each client. Client can be gone for a week and you need to be available to pet sit for a week, possibility 2-3 times a day for that client while they are gone. Sitters must be available (Monday through Friday) between 10am-3pm. You will be walking 1-2 dogs in clients neighborhood rain or heat! Each visit is about 30-45 minutes for 1-2 dogs. Must have experience walking dogs on a leash. Be able to walk mile. Capable of walking two large, energetic dogs (50lbs +) at once. Available from 6/8 pm to 6/8 am including weekends and holidays. Sitters will stay/sleep at the client’s home for duration of 10-12 hours from evening to morning. Sitters must have their own place to live, as this is supplemental income only. You may stay at one client’s home from 1 night up to 10+ nights consecutively depending on how long the client’s reservation is. You can work a 9-5 job and still be an overnight sitter. Available for all MAJOR holidays and rarely travel. Prefer volunteer and /or has pet care experience with local vet clinics, animal shelters, groomers, pet stores, etc. Preferred experienced in the administration of injections for both cats and dogs and oral medication. Have reliable car, a cell phone (smart phone preferred), access to the internet, and ability to check e-mail daily. Mature, responsible, self-motivated, and professional adult. Strong sales skills and positive attitude. Outgoing personality and an animal lover (cats and dogs especially). We have a very detailed process. Serious applicants only! All services are contracted, and commission-based. We do not guarantee any steady income as this is supplemental income only. We screen all applicants and conduct a face-to-face interview. We then conduct a full criminal background check on applicants in consideration. We call all professional and personal reference. After they are accepted to work with TLC, each sitter is required to receive their Pet First Aid and CPR Certification. We solicit ongoing feedback on all sitters to make certain that they are living up to the standards of TLC House & Pet Sitting Services. To continue, please fill out our screening form and answer survey questions that will be emails to you. You must follow these instructions to meet our requirements, then will be in touch. TLC independent contracted pet sitting professionals sets a standard of excellence in pet care . A TLC representative will respond to inquiries which meet our needs for availability, area, and experience. We thank you for your interests in being a independent contractor with TLC in a rewarding opportunity.